Three bedroom and three bath home with spectacular ocean views and always changing sunsets. Aka'ula means "red sunset" which can be enjoyed every day from from this private and gated property on a hillside in Haiku. 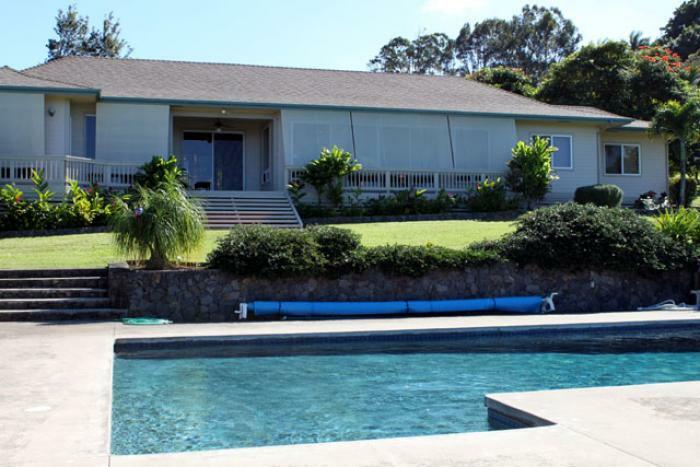 Centrally located, just a few minutes from famous windsurfing beach Ho'okipa and about 10 minutes drive to Paia town. Haiku town center with restaurants and a great yoga and dance studio is just a few minutes away. The house is furnished in contemporary style with island accents, comfortable and enjoyable. A home away from home. This is a non-smoking property. Cleaning fee is $350. Maximum occupancy is six (including up to 2 children age 2 and older). Minimum stay is 5 nights (14 nights over Christmas holiday). Must deposit $1000 and have renter's agreement. Taxes 13.42% are not included. Rates may change at any time and are only guaranteed upon reservation.